Many of us in the legal industry sit on non-profit, educational or corporate boards. Inevitably, presentations are made by staff, advisers and fellow board members. 75 percent of the time, they use PowerPoint, and 99 percent of the time they make classic and easily avoidable mistakes when using this program. PowerPoint is a great tool. A paint brush is a great tool. However, in the wrong hands, no matter how well intentioned, misuse of either tool can yield horrible outcomes. 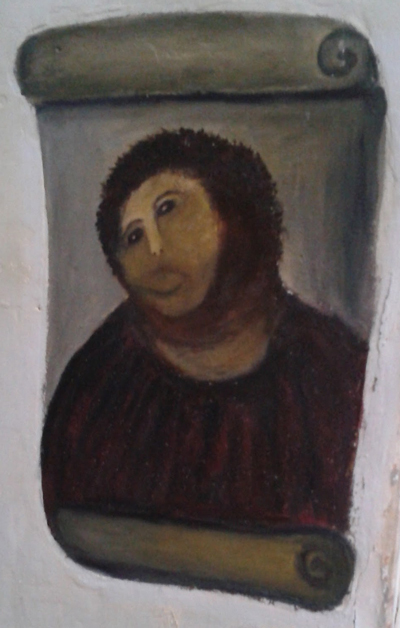 When using PowerPoint, these outcomes may not be as devastating as the wretched Spanish fresco restoration pictured to the right, but they are unnecessarily neglectful. At A2L Consulting, we not only help trial lawyers prepare sophisticated trial presentations, we also help lawyers and non-lawyers prepare presentations outside of the courtroom. Sometimes these presentations are for lobbying or advocacy efforts and sometimes they are for CLE's or board presentations. I'll even let you in on a secret - if our schedule permits it, we often prepare presentations for our clients outside the courtroom gratis. We do this because we want our clients to look good no matter where they present. Avoid Bullet Points Entirely: Yes, entirely. In most instances, use of bullets in a presentation will be harmful. Since people read faster than you can speak, your audience will read the bulleted text and then ignore what you say. Our article with 12 reasons not to use bullet points includes 74 workarounds and alternative approaches. Follow a Format: A well-crafted presentation follows a format that is itself well-crafted. I share two approaches that I use frequently in the article How to Structure Your Next Speech, Opening Statement or Presentation. Prepare 30:1: I believe that if you want to deliver a great presentation, you will need to invest 30 times the amount of time allocated for your presentation preparing for your presentation. For example, if you have a 20-minute board presentation coming up, you should invest 10 hours preparing for it. In the article 21 Steps I Took for Great Public Speaking Results, I outlined the 90-day method I followed for a 45-minute conference presentation. I'm giving a commencement address in May (five months from this writing), and I have already started preparing for that and even engaged a friend to coach me. Never Read Your Slides: If you read what is written on your slides, your audience will remember less than if you had either presented only orally or just shown slides. See our articles covering the redundancy effect and the split-attention effect. Mix Your Media: There is good science that establishes and quantifies the high value of using a visual presentation. However, there is also good science that says that you need to use a visual presentation in a certain way to get real value. In general, I recommend using a few dynamic slides and having a handout or poster-board as part of a presentation strategy. This article, equally applicable for the boardroom, reiterates many of these points and offers many reasons, grounded in science, for mixing your media up in unexpected ways: 6 Trial Presentation Errors Lawyers Can Easily Avoid. State Your Intention - Inform or Inspire: In the beginning of a presentation, state whether your intention is to simply report data or whether you want to ask the board for a specific action. Doing so will help you achieve your intention as people will not be waiting for a sales pitch in a report-only presentation, and your audience will not be surprised by your 'ask' in a persuasive presentation if it comes only at the end. One concept per slide: Steve Jobs was a master of this technique. He would simply show a word or a picture and talk about it. You needn't be so avant-garde in your approach, but I do think you should keep your thoughts to one per slide, especially in a persuasive presentation. Learn to Use the B-key: Most people don't know that when using a presentation program, hitting the "B" key will black out the screen. Hitting it again will instantly bring it back on. Unless leaving up a slide that is not directly related to the point you are making serves some purpose, hit the B-key when speaking to focus the attention on what you are saying. Own the Technology: The technology you will use to present works as expected about half the time in my experience. To the extent that you can, control all of the technology in the presentation room to avoid a presentation technology meltdown. Tell a Story: There is real value in using stories as a persuasion tool. We're presenting a free webinar on this topic next month. If you are subscribed to this blog, you will see a notice about it soon. In the meantime, here is an article and a video about one presentation that features A+ storytelling. Do you Really Need a Visual Presentation? Most people prefer to receive information visually. With that said, not every presentation will benefit from a visual presentation, particularly if it is not done well. You must ask yourself whether you need a presentation to fulfill your intended purpose and whether you honestly intend to put in the work required to do it well. Sometimes, it is best to avoid a visual presentation altogether. Seek Help Early Not Late: As I mentioned earlier, we often prepare presentations for use outside the courtroom at A2L Consulting. We even prepare such presentations gratis for our clients when we can. The one thing I can say about every time that we have helped is that the earlier you start, the better the presentation. There is simply no fast-forward button on the creative process. Get help, but get it early.